On Thursday, the Food and Drug administration approved the use of genetically modified salmon for human consumption. That’s the first time it’s approved a genetically modified animal to be eaten. The salmon, called the AquAdvantage salmon, is modified to grow about twice as fast as an ordinary salmon. AquAdvantage salmon don’t have to be labeled in any way that separates them from any other kind of salmon. If you fall into either camp, chances are good that you’re not even interested in hearing information that might make you change your mind. Maybe you don’t believe that any such information exists, or maybe because you’re subconsciously afraid that it will be persuasive and you’ll have to go through the (legitimately scary and painful!) mental upheaval of questioning your own beliefs. In fact, if you keep reading this paragraph and it starts supporting the “wrong” side of the debate, you’ll probably close the tab in disgust, maybe post an angry Facebook comment, and go about your day without considering any of the evidence presented. All of us do that. Confirmation bias (seeking out evidence that supports what we already believe) is an inherently human flaw that everyone is prey to, at least on one or two topics (politics is one that’s been extensively studied). And pointing it how hard it is to change an opinion isn’t being patronizing: it’s a fact for everyone. Changing a belief, especially a belief that we’re emotionally invested in, is very difficult and even painful, and it’s a rare person who can do it gracefully. So what does this have to do with the salmon? This incredibly entrenched, my-team-vs-your-team approach to GMOs is why the genetically modified salmon are so hard to write about. For that matter, it’s why GMO politics in the first place are such a mess: both sides of the “debate” are just screaming past each other and ignoring what the other one has to say. That’s not a “debate” and it’s certainly not a “conversation;” it’s a shouting match. If you’re willing to accept the possibility that your beliefs might change and engage with evidence that could challenge them, keep reading for an attempt (bearing in mind that the author also has biases!) to look at evidence from both sides of the debate. If you’re not up for that, and you’re just looking for something that you already agree with and a rehash of positions you already support, this isn’t it for either side, so you might want to close the tab now for the sake of your own blood pressure (angry Facebook comment optional). Why are we Genetically Modifying Fish? Because we need a solution to our incredible fish supply problem. Our oceans are overfished, they’re only getting more overfished every year. We’re already looking at a massive ecological crisis, and if consumers keep demanding as much fish as we’ve been demanding, we’re going to strip the ocean bare and be left with nothing for anyone. That’s not hyperbole. We can either eat less fish, or we can find a better way to raise fish that doesn’t trash the planet. Fish is nutritious and tasty, so there’s no health reason to eat less of it. And despite increasingly dire warnings from basically every environmental group that looks sideways at the problem, almost nobody is willing to eat less fish for the sake of the planet when there doesn’t appear to be any immediate crisis and prices are staying the same. So basically we have one option: find a better way to raise the fish. Fish farms were supposed to be the answer, but fish farms have issues (pollution, to name a big one, plus the problem of how to feed all the fish in the farm without just shifting the overfishing problem down the food chain). Genetically modified salmon might be able to address some of those problems. 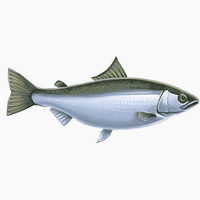 For example, the AquAdvantage salmon is modified to grow more efficiently, so it eats 25% less food than regular salmon. This makes it more sustainable to farm. OK, great. But the two big problems raised regarding these fish are safety to humans and safety for the environment. Are the Genetically Modified Salmon Safe? Are the fish safe to eat? The FDA says yes, citing “rigorously evaluated extensive data submitted by the manufacturer…and other peer-reviewed data.” This is the document that the FDA used to establish the safety of the fish (it’s free to anyone, so you can go in and read it yourself if you want). There were no relevant differences between AquAdvantage salmon and regular salmon in the overall composition of the fish, or in its components (protein, vitamins, minerals, fats, etc.). Specifically, the AquAdvantage salmon had the same amount of Omega-3 and Omega-6 fats as regular salmon. The AquAdvantage salmon were not more allergenic than ordinary salmon. The fish aren’t labeled because the FDA has determined that there is no difference in nutritional value or cooking qualities. Again, the report cites all the studies used in more detail if you want to go into it. On the other hand, some critics have taken a harsh look at that report. If you’re interested, here’s Consumer Watch’s critique of the science. Consumer Watch notes among other things that some of the relevant studies had small sample sizes, or used the wrong type of control group. It’s also worth noting that “regular salmon” has a wide variation in Omega-3 fats and Vitamin D, and if the AquAdvantage salmon is equivalent to other farmed salmon, then wild-caught salmon will still be superior to both. The AquAdvantage salmon won’t be in stores for another two years; in those years, we might see even more studies that support or challenge the safety of the fish. The other big danger of the salmon is that they might escape into the ocean, where they could easily beat regular salmon in the competition for food. If enough AquAdvantage salmon escaped, they could be dangerous to populations of unmodified salmon. AquAdvantage salmon are being raised in ways designed to prevent that – in tanks inland (basically big swimming pools) rather than pens in the sea. According to the FDA, the tanks have protections along the bottom, nets over the top, fences to prevent fish from jumping out, and covers on drains and other plumbing to prevent fish from getting out that way. The fish are also sterilized, but the sterilization process is very imperfect, and not something we’d want to rely on by itself. The Center for Food Safety also notes that the company will need some fertile fish as breeding stock, and these fish are being raised near wild salmon habitats, so if they did escape, they could cause big problems. There’s a very reasonable objection that instead of trying to solve the environmental problems with fish farming by breeding genetically modified salmon in tanks, we should address the actual problems with what we’re doing to the oceans, and try to clean up the (massive) damage we’ve already done. Fair enough, but the obvious counter-argument is that clearly, most consumers aren’t willing to do that. We’ve known for decades that we’re wrecking the oceans, and advocacy groups still haven’t been able to change that. For most people, as long as they can get $0.98 cans of fish at Wal-Mart, they’ll keep buying them without caring about the ramifications. Since addressing the environmental issues directly appears to be a political impossibility, at least we can reduce the damage. The AquAdvantage salmon aren’t in stores right now, and they won’t be for at least two years, so there’s no immediate decision to make. You have time to think about it and consider the issue. Some stores (like Whole Foods, Target, and Trader Joe’s) have also declared that they won’t sell the fish at all, so if you want to avoid them in two years when the fish come out, you can just shop at those stores. Regardless of what side of the debate you’re on, why not take those two years to really think about it, consider opinions that might challenge your own, and enjoy a hearty laugh every time you hear someone panicking about “Frankenfish.” You can’t just call it a “Frankenfish” and expect that to close the case. That’s not evidence, and it’s not an argument; it’s just name-calling. If there’s specific evidence of danger or safety, cite it, and demand that other people cite it too. If there’s a specific question or problem that hasn’t been addressed by the evidence, name it. Appeals to fear about things that “just aren’t right” and weird nicknames out of horror movies aren’t the way that reasonable adults discuss what we are and aren’t going to eat.